Taiwan’s GDP grew continuously for three quarters, for the increasing demand of both export and domestic market. 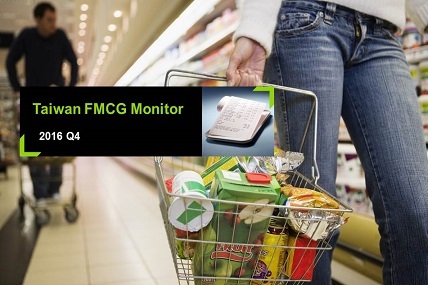 2016 FMCG market has recovered to the level before food safety incidents. Instant noodles, fast-cooked noodles, and frozen food featured convenience drove cooking related food category to grow. The quick soup powder of hot pot also performed well because more players joined the market. Snacks, candy and RTD tea blew up for various new products. In addition, the health concept remained fad, driving breakfast cereals, cheese, and soy milk to grow. Some up trends are shown in non-food categories: makeup in personal care, adult diaper and denture cleansing in elder care, and premiumization in detergents. Tissue paper started to grow in both high and low price tier. PX mart strengthened itself in food category, reaching 20% value share. The cooking related food, dry provisions, fresh milk, and RTD tea drove the growth. EC continued to grow, especially in personal care products, such as skincare and makeup, haircare, and papers, as well as health food and hot fusion products.